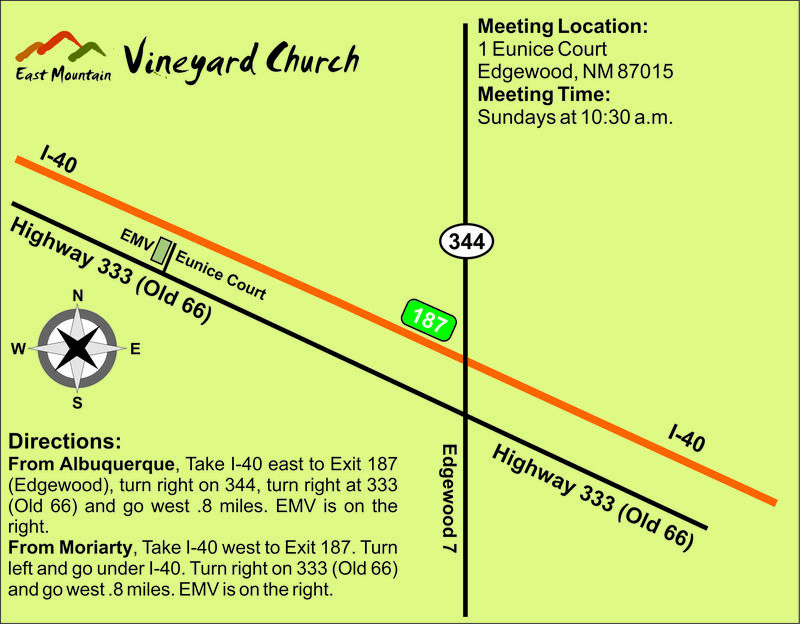 Last week we began looking at repentance from dead works. We saw that repentance means to have a change of mind or to do an about face. 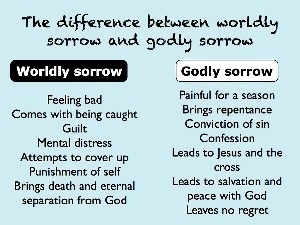 This week we will be looking at godly sorrow and worldly sorrow. In 2 Corinthians 7:10, Paul talks about a sorrow that is according to the will of God which produces repentance without regret and leads to salvation. We call this godly sorrow. He also speaks of the sorrow of the world which produces death. Worldly sorrow is simply being sorry for getting caught, but not being sorry for the actual crime committed. This is the sorrow that produces no change in behaviour and results in death. Example 1: When I was young I loved to tease my sister. She would cry and I would get in trouble. I had worldly sorrow. I was sorry that I got in trouble, but did not have godly sorrow. I kept teasing her. There was not a change in heart, mind, attitude and behaviour. Example 2: As a prison chaplain we saw lots of men who cried and appeared to be sorrowful about their crimes. Unfortunately, many of these men would be re-incarcerated once they had served their sentence. There is a 71% rate of recidivism. Many of these men were just sorry that they got caught and were in prison. It was not a godly sorrow that produced a genuine change in their lives. 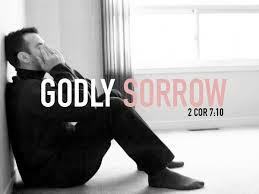 Godly sorrow is an attitude of sorrow for having committed a deed that is contrary to God’s will. It produces repentance without regret leading to salvation. It results in a change of behaviour, to becoming more Christ-like. Example 3: When Karen and I married, I would lovingly tease her. She did not appreciate it and would get upset. Because it upset her, I felt very sorry for my actions. I stopped teasing her because I did not want to hurt her in any way. I had a godly sorrow that resulted in a change of my actions. John the Baptist told people to bring forth the fruit of repentance. He was exhorting them to live different lives that verified their repentance. If we want to make a difference in our generation, we must demonstrate to the world that we are serious about living uprightly. The world is looking for a people that live the message – that are bringing forth the fruit of repentance. “Father, we want to be a people whose lives reflect Your character, and Your nature. We want to be a people who have soft hearts and have a godly sorrow for our sins. We want to be a people that brings forth the fruit of repentance. We want our lives to be a testimony to our generation.We ask these things in Jesus’ name. Amen. 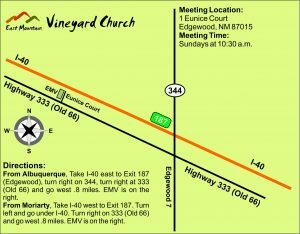 This entry was posted in Foundations and tagged East Mountain Vineyard, EMV, Forgiveness, Grace, Jesus, Lives changed, Repentance, Sorrow. Bookmark the permalink.